A Maitland River fall steelhead taken on a favorite spey rod! 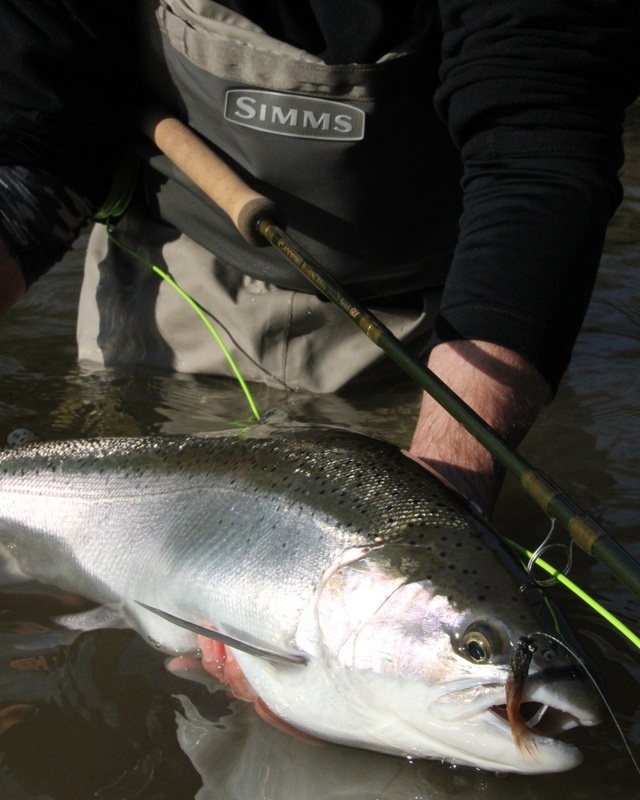 Fly Fitters offers guided fly fishing, spey fishing, and sport fishing adventures on the Maitland River, Bayfield River, and Saugeen River in SW Ontario, along the shore of Lake Huron, located near the town of Goderich, Ontario. Our in-depth knowledge of these rivers in southwestern Ontario will allow you to have a very rewarding day on the river! Fly Fitters is the premier fly fishing guiding operation along Ontario’s West Coast. We entertain a small number of guests at a time, allowing us to tailor experiences to your preferences. This ensures everyone enjoys an outstanding wilderness fly fishing adventure. Through out the year, the local rivers provide a beautiful setting to fly fish for steelhead, resident trout, smallmouth bass, largemouth bass, muskie, and carp. Fly Fitters is a member of the Huron Tourism Association since opening in 2002. A day with Fly Fitters compliments any vacation plans on Ontario’s west coast! We are located close to many fabulous restaurants, accommodations, golf and theatre experiences. Fly Fitters is an Ontario fly fishing outfitter located on Ontario’s west coast near Goderich, on the doorstep of the scenic Maitland River. We provide all levels of anglers with exceptional fly fishing and outdoor fishing experiences. Our livelihood relies on the healthy aquatic ecosystem of the local waterways. We strive to conserve, protect and rehabilitate them. We practice only catch and release for all our fishing adventures and we encourage other anglers to do the same! Click on this map for more tourism information. ...... click here to see rates and packages! ...... click here to email FlyFitters!